Children are naturally creative beings. They have active imaginations, enjoy playing pretend, and don’t feel as boxed in as adults do by certain things we know to be true. Children are exploring their world and having fun with everything around them. In order to help their creativity grow and offer them an outlet for their active imaginations, it’s important to give them a channel to release it. Crayons and paper are great, so are Legos or markers, but there are many artistic projects to offer to your children. Allow your children to write, play music, or practice photography with a few different at-home activities to help bring out different types of creativity. Writing a journal is a wonderful activity to boost your child’s creativity. Writing helps many areas of the developing brain from hand coordination to abstract thought to vocabulary. The journal will look a lot different for the age and capabilities of each child, but it’ll help your creative child to write a little every day. Leave it up to them, but it will most likely be beneficial to offer some sort of prompt. Ask them to write a story about an animal, a list of all the green things they can find, or a letter to their favorite movie character. This will help inspire the writer in them while also improving their writing skills. Make the journal yourself, buy a three-ring notebook, or use an online journal to get your children writing. Experiment with different types of writing from free-writing to poetry to short stories and see what they enjoy. Music is an amazing learning tool for children and has been shown to aid in environmental learning and social skills, among other things. For a musical child, starting a band is a great way to get their creativity flowing. This doesn’t have to mean buying instruments, but your child and their siblings, cousins, friends, can start by making instruments, writing songs, or singing along with music they know. Encourage exploration, use toys that create music, and help them jam out. With so many toys and movies featuring sing-alongs and music, children tend to have a natural inclination towards music. By starting a band your child will combine their creativity with teamwork and find fun in the sound they can create. Another great creative activity for kids tied to music is dancing. Many kids love to dance and move to their favorite songs or imitate the dances they see on their favorite movies. Dance classes are a great way to get your child involved in the creative side of dancing while exploring a new art, testing their memory, and staying active. Whether its ballet, hip-hop, tap, or line dancing, it’ll teach your kiddo how to move to music using different techniques. For fun at home, you can choreograph your own dance with your children even if you don’t know the techniques like an instructor would. Have the kids help you with the moves, be silly, and let them pick the music. Not only is this a fun activity, it’ll help encourage their creative thoughts and innovation. Anyone who’s handed their phone to a toddler understands their infatuation with the camera. Hundreds of photos of fingertips, the floor, and part of their eye are hardly photographic masterpieces, but it’s clear that many kids enjoy taking photos. 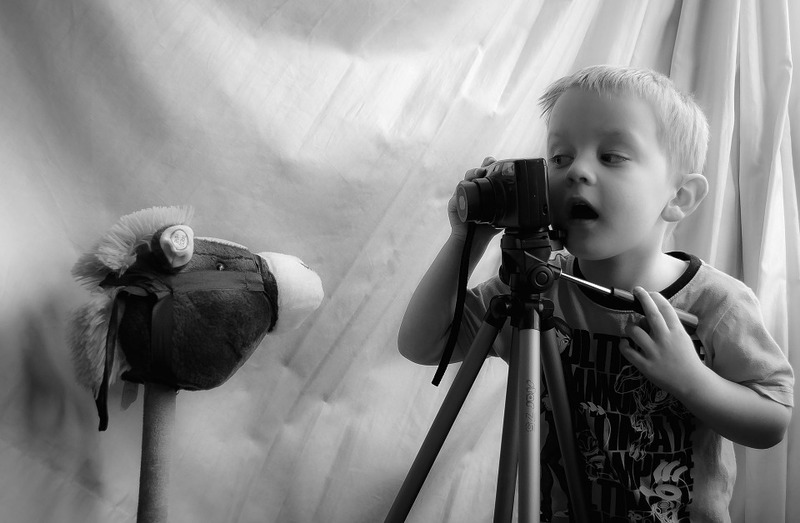 Whether it’s utilizing a disposable camera, a Polaroid camera, or just your cell phone, give your little one a little free range with photography to use some of their creativity. It might be helpful to give them some prompts, offer older kids some basic mobile photography tips, or teach them a little bit about the camera and how to take photos. Make a list of photos for them to take to avoid 600 photos of their feet such as a self-portrait, a picture of their favorite toy, a picture of their pet, a landscape, or a photo really close up to give them some direction. 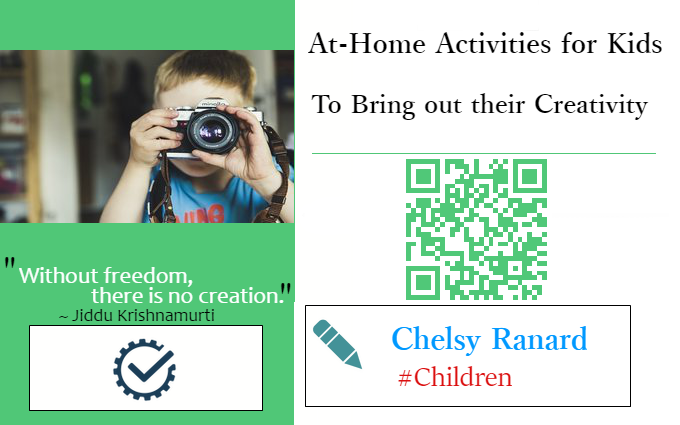 Print them out and make a photo book for them to enjoy. This will help them understand light, see things from another perspective, and find beauty in the mundane. There are so many creative outlets for your children to use to bring out their artistic side. Maybe they are painters, dancers, videographers, musicians, photographers, writers, or sculptors. Without certain activities to promote that creativity they might not know how to showcase their creative passions. See what they like, help them grow, and offer them many different activities to explore the creative side. At the end of the day you’ll have a fun story, music to listen to, a dance to watch, or photos to look at and your children will feel accomplished in their ability to create something fun.